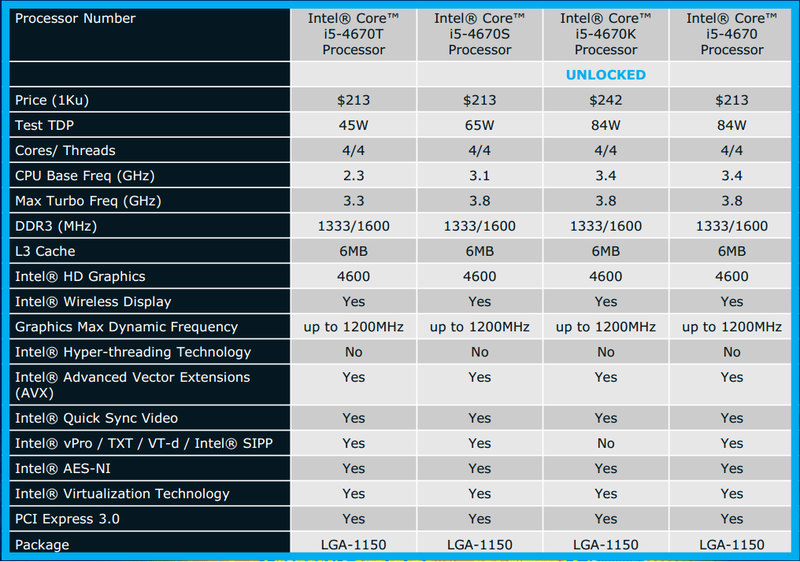 On Saturday, Intel fired a salvo of ”Haswell” microprocessors across AMD’s bow. Now, Intel’s chief rival has responded in kind, with five new desktop processors that combine midrange microprocessor power with AMD’s powerful graphics technology. 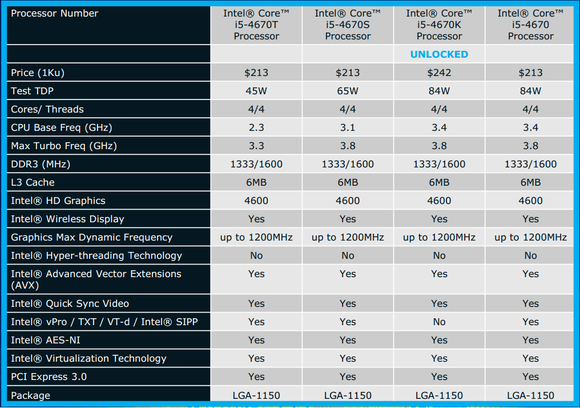 AMD’s A team is the A-series: the A10, A8, and A6 chips, aimed at Intel’s Core i3 and Core i5 microprocessors. Although AMD calls the chips its flagship offering, the A-series chips concede the high end of the market to Intel’s Core i7. On the other hand, they’re priced accordingly: AMD sells the low-end A6-6400K for $77, on up to the $149 A10-6800K. Overall, AMD says Richland will yield 21 percent more graphics performance (using the 3DMark “Fire Strike” benchmark) versus the previous generation, dubbed “Trinity,” as well as 8 percent more performance using the more generic PCMark 7 benchmark. That’s because the Richland chips include Radeon HD 8000-quality graphics. All of the Richland APUs are part of what AMD calls its “Elite A-Series” platform, and will be built into PCs from Acer and Hewlett-Packard. The “Trinity” parts won’t go way, at least immediately, according to Adam Kozak, a senior product marketing manager for AMD. Instead, they’ll simply slot in alongside Richland. 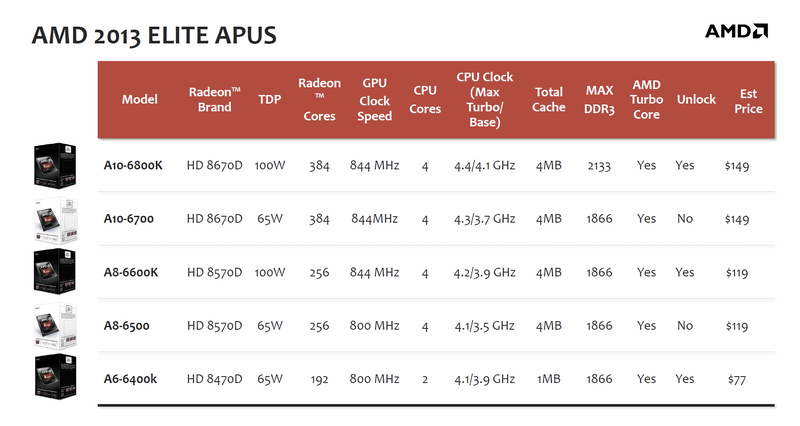 AMD's new A-series APU lineup. Although Intel far outsells AMD in the desktop space (Intel has about 80 percent of the desktop PC market in terms of the number of processors sold, according to Mercury Research), AMD has gamely hung in there, divesting its manufacturing operations and even selling its offices (then leasing them back) in an effort to save cash. AMD recently detailed its three mobile platforms: Temash, Kabini, and Richland, in an effort to chase down Intel in the mobile space. At the Computex show in Taiwan, AMD specifically outlined its plans for the desktop version of the Richland platform; an update to the Kabini all-in-one platform is also due for 2013, executives said. Once, the desktop was the battleground over which Intel and AMD’s chips pushed to and fro, each seeking to outdo the others in terms of graphics and raw processing power. Today, with desktops on the decline, AMD is battling for a smaller slice of PC gamers who may or may not want to add in a discrete GPU in the future, and where price continues to be a driving factor. AMD also suffered from some missteps that caused the company to lose ground in the race between itself and Intel, noted Patrick Moorhead, principal at Moor Insights and Research. ”Intel has a lock on the commercial PC market, so AMD is left competing in the consumer space,” Moorhead said in an email. “In that space, AMD had some key execution problems that drove to decreased desktop and notebook market share” - specifically, the fact that the previous generation, “Trinity,” arrived late and missed the key-to-school selling season, he said. Trinity’s predecessor, “Llano,” also suffered manufacturing problems. Llano had 32nm manufacturing and supply challenges and Trinity came late to market, missing the back to school market. In this regard, AMD has made some effort to ease the transition from one generation to the other. The new A-series parts use the same FM2 socket as AMD’s previous “Trinity” chips, for example. For years, games and graphics have sold PCs, and the A-series is no different. AMD’s argument is that, by itself, its highest-end A10 APUs should outperform the combination of a Core i5 4670K+ (the older “Ivy Bridge” parts) and an Nvidia GT 630 discrete chip. AMD also claims that the pairing an A10-6800K with a AMD HD 6570 will outperform a similar Core i5 4670K, also with a Radeon HD 6570 running alongside. 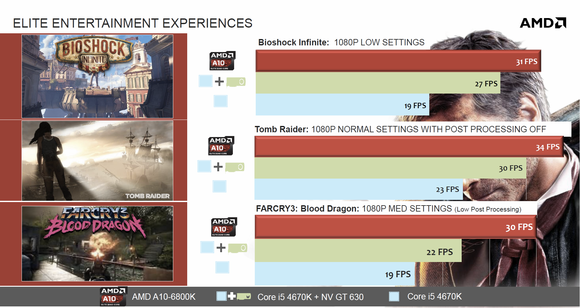 These are cherry-picked benchmarks, granted, but they’re worth a second look if you’re concerned about cost. The idea is that the processor portion of the APU, once the focus of all development, has taken a back seat to improving graphics over the past few years. “We’re really adament about balanced architectures being the future of computing,” Kozak said. Don’t expect any free games to be bundled with the Richland parts—the industry is just in a relatively dead zone for new games, Kozak added. 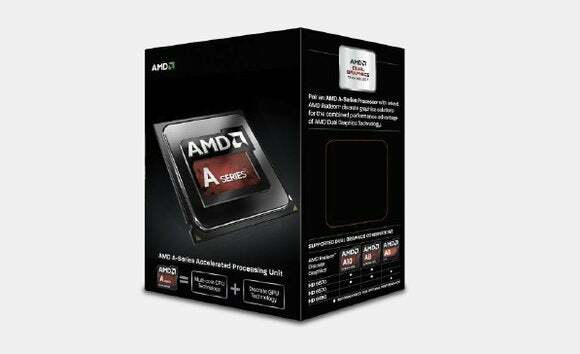 AMD will also sell an optimized DDR3-2133 memory and an FM2 motherboard line for gamers wishing to configure a tuned, all-AMD PC, AMD said. Traditionally, AMD's combination of a GPU and microprocessor on the same die has been in name only - the two chips have used separate logic, memory pools, and paging. AMD is moving toward a model where the CPU and GPU better share resources, known as heterogenous computing. At Computex, AMD showed off the next generation of the technology in a chip known as "Kaveri," reportedly due in the second half of 2013. AMD also showed off the fruits of a partnership with Splashtop, where the APU can be used as an engine to stream PC games to nearby mobile devices - clearly a response to Nvidia, whose Project Shield technology can do the same thing.